COMMENTS:        This trigger occurred at longitude,latitude = 179.16,-16.58 [deg]. COMMENTS:       NOTE: This SPIACS event is temporally(5.0<100sec) coincident with the SWIFT_BAT event (trignum=702699). Dec(J2000) = +36d 54' 04"
with an uncertainty of 3 arcmin (radius, 90% containment, including systematic uncertainty). The BAT light curve showed a complex structure with a duration of about 60 sec. The peak count rate was ~10000 counts/sec (15-350 keV), at ~22 sec after the trigger. XRT is temporarily offline, and so there will be no immediate data from this GRB. UVOT took a finding chart exposure of 150 seconds with the White filter starting 75 seconds after the BAT trigger. No credible afterglow candidate has been found in the initial data products. The 2.7'x2.7' sub-image covers 25% of the BAT error circle. The typical 3-sigma upper limit has been about 19.6 mag. The 8'x8' region for the list of sources generated on-board covers 100% of the BAT error circle. The list of sources is typically complete to about 18 mag. No correction has been made for the expected extinction corresponding to E(B-V) of 0.14. We imaged the field of GRB 160703A detected by SWIFT (trigger 702699) with the Zadko robotic telescope (D=100cm) located at the observatory - Gingin, Australia. The observations started 5.5h after the GRB trigger. The elevation of the field decreased from only 20 degrees above horizon and weather conditions were good. Dec(J2000) = +36d 54' 46.2"
with an uncertainty of 1.0 arcmin, (radius, sys+stat, 90% containment). The partial coding was 84%. The mask-weighted light curve shows many overlapping peaks starting at ~T-26 sec, with the brightest peak at ~T+28 sec, and ending at ~T+75 sec. T90 (15-350 keV) is 44.4 +- 2.8 sec (estimated error including systematics). The time-averaged spectrum from T-26.43 to T+52.57 sec is best fit by a simple power-law model. The power law index of the time-averaged spectrum is 1.34 +- 0.04. The fluence in the 15-150 keV band is 9.0 +- 0.2 x 10^-6 erg/cm2. The 1-sec peak photon flux measured from T+26.64 sec in the 15-150 keV band is 5.8 +- 0.3 ph/cm2/sec. All the quoted errors are at the 90% confidence level. The long GRB 160703A (Swift/BAT observation: Cenko et al., GCN 19645; Lien et al., GCN 19648) triggered Konus-Wind at T0=3D43807.015 s UT (12:10:07.015). The light curve shows multiple overlapping pulses, a total duration of the burst is ~50 s. The emission is seen up to ~4 MeV. As observed by Konus-Wind, the burst had a fluence of (2.7 =B1 0.2)x10^-5 erg/cm2 and a 64-ms peak energy flux, measured from T0+23.360, of (2.8 =B1 0.3)x10^-6 erg/cm2 (both in the 20 keV - 10 MeV energy range). The time-integrated spectrum (measured from T0 to T0+41.216 s) is best fit in the 20 keV - 10 MeV range by a cutoff power-law (CPL) function with the following model parameters: the photon index alpha =3D -1.01(-0.09,+0.10), and the peak energy Ep =3D 327(-36,+46) keV, chi2 =3D 93/97 dof. Fitting this spectrum with the GRB (Band) function yields the same alpha and Ep with only an upper limit on beta of -2.4, chi2 =3D 93/96 dof. The spectrum near the peak count rate (measured from T0 to T0+41.216 s) is best fit in the 20 keV - 10 MeV range by a cutoff power-law (CPL) function with the following model parameters: the photon index alpha =3D -0.66(-0.15,+0.16), and the peak energy Ep =3D 272(-29,+35) keV, chi2 =3D 79/89 dof. Fitting this spectrum with the GRB (Band) function yields the same alpha and Ep with only an upper limit on beta of -3.1, chi2 =3D 79/88 dof. We imaged the field of GRB 160703A detected by SWIFT(trigger 702699) with the robotic telescope of (IAU station 565) Bassano Bresciano Observatory, Italy. Member of: AAVSO - American Association of Variable Star Observers. ISSP - Italian Supernovae Search Project. UAI/SSV - Unione Astrofili Italiani/sezione stelle variabili. The observations started 8.31 hour after the GRB trigger, with our Schmidt telescope D=320/400 mm F/D=3.1. We co-added a series of exposures of 120 sec each. 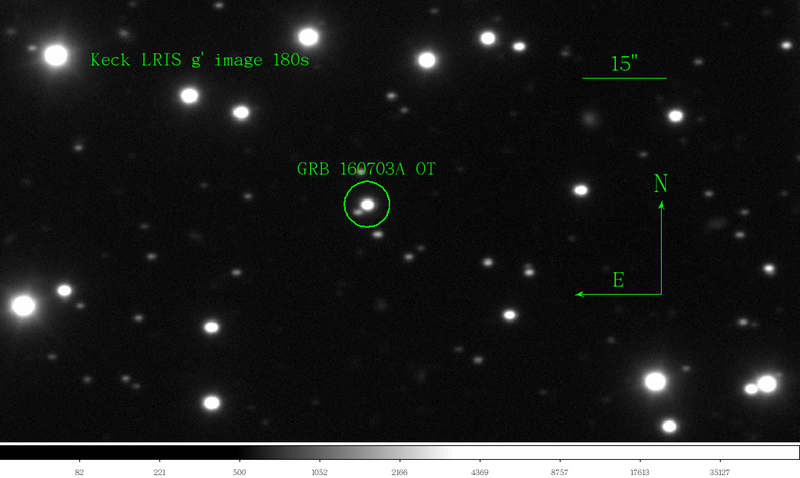 We report the optical follow-up observations of GRB 160703A (S. B. Cenko et= al., GCN Circular #19645) with a tricolor camera (g', Rc, and Ic) attached= to the MITSuME 50 cm telescope of Akeno Observatory, Yamanashi, Japan. Dec(J2000) =3D +36d 55' 08.1"
with an uncertainty of ~0.5 arc sec. We used GSC2.3 catalog for flux calibration. Further analysis is ongoing. We observed the field of GRB 160703A (Cenko et al., GCNC 19645) with the optical three color (g', Rc and Ic) CCD camera attached to the Murikabushi 1m telescope of Ishigakijima Astronomical Observatory. The observation started on 2016-07-03 12:12:55 UT, (~2.8 min after the burst). We detected the previously reported afterglow (Tachibana et al., GCNC 19652) in in all the three bands. Swift-XRT has performed follow-up observations of the Swift/BAT-detected burst GRB 160703A (Lien et al. GCN Circ. 19648), collecting 5.0 ks of Photon Counting (PC) mode data between T0+107.8 ks and T0+120.4 ks. with an uncertainty of 3.9 arcsec (radius, 90% confidence). This position is 92 arcsec from the Swift/BAT position and 5.1 arcsec from the optical transient reported by Tachibana et al. (GCN Circ. 19652). The light curve is consistent with a constant source of mean count rate 1.7e-02 ct/sec. A power-law fit gives an index of 2.92 (+0.03, -3.89). A spectrum formed from the PC mode data can be fitted with an absorbed power-law with a photon spectral index of 1.9 (+0.7, -0.5). The best-fitting absorption column is 3.0 (+3.9, -1.5) x 10^21 cm^-2, consistent with the Galactic value of 1.5 x 10^21 cm^-2 (Willingale et al. 2013). The counts to observed (unabsorbed) 0.3-10 keV flux conversion factor deduced from this spectrum is 3.9 x 10^-11 (5.4 x 10^-11) erg cm^-2 count^-1. The results of the XRT-team automatic analysis are available at http://www.swift.ac.uk/xrt_products/00702699. The results of the full analysis of the XRT observations are available at http://www.swift.ac.uk/ToO_GRBs/00702699. The Swift/UVOT began settled observations of the field of GRB 160703A 75 s after the BAT trigger (Cenko et al., GCN Circ. 19645). We detect a fading source consistent with the XRT position (D'Elia et al. GCN Circ. 19655) and optical detections (Tachibana et al., GCN Circ. 19652; Kuroda et al., GCN Circ. 19653). The detection in all UVOT filters is consistent with a redshift of z < ~1.5. The magnitudes in the table are not corrected for the Galactic extinction due to the reddening of E(B-V) = 0.15 in the direction of the burst (Schlegel et al. 1998). We observed the field of GRB 160703A (Cenko et al., GCN 19645) with the 10 m Keck-I telescope on July 3 starting at 13:17:55 UT, or 1.125 hours after the burst. A 180 s g'-band image and a 150 s R-band image were taken simultaneously with LRIS. We detect the optical afterglow (Tachibana et al., GCN 19652; Kuroda et al., GCN 19653; Hagen & Cenko, GCN 19656) in both the g' and R images. The afterglow is well separated in our images from the nearby source N2JN062852 noted by Tachibana et al. (GCN 19652). We measure the afterglow to be 1.58" west and 1.30" north of N2JN062852. A finding chart is posted at website URL http://w.astro.berkeley.edu/~zwk/grb/GRB160703A/GRB160703A_keck_lris_g_fc.png . We find that the afterglow had a brightness of R=17.9 mag at 1.125 hours after the burst, calibrated with the USNO B1.0 R2 system. Russian space mission "Lomonosov" (*) ( http://lomonosov.sinp.msu.ru/en/ ) was launched 28.04.2016 from new Russian Kosmodrom "Vostochny" to polar solar-synchronous orbit with altitude ~490 km. Scientific program of "Lomonosov" includes a multi-wavelength GRB study at different time scales. In particular the complex study of prompt emission will be provided based on the direct recording of readings of wide field optical cameras as well as on the fast pointing of optical and UV telescope using its moving mirror. The spacecraft "Lomonosov" contains 3 instruments for GRB study: gamma-ray burst monitor BDRG ( http://lomonosov.sinp.msu.ru/en/scientific-equipment-2/bdrg ), a wide field optical camera SHOK ( http://lomonosov.sinp.msu.ru/en/scientific-equipment-2/shok ) and UFFO ( http://lomonosov.sinp.msu.ru/en/scientific-equipment-2/uffo ) instrument consisting of coding mask X-ray telescope UBAT and UV slewing mirror telescope SMT. The Lomonosov GRB monitor BDRG is designed to obtain temporal and spectral information about GRBs in energy range 10-3000 keV as well as to produce GRB trigger. The trigger is used onboard to fix some amount of data before GRB stored in the internal memory of all instruments of GRB complex as well as to start the detailed data collection. Immediately after the trigger the onboard estimation of the GRB position starts. Then the telegram with trigger information is sent via Global Star transmitter to the server in MSU and, after automatic ground-based data processing (to exclude radiation belt zones etc.) to GCN (this will be realized sometime later after optimizing the trigger parameters during flight tests). The AMI Large Array robotically triggered on the Swift alert for GRB 160703A (Cenko et al., GCN 19645) as part of the 4pisky program, and subsequent follow up observations were obtained up to 10 days post-burst. While the first observation on 2016 Jul 03.83 was severely affected by RFI, our observations at 15 GHz on 2016 Jul 04.99, Jul 07.00, and Jul 11.00 (UT) do not reveal any radio source at the XRT location (D'Elia et al., GCN 19655), with 3sigma upper limits of 150 uJy, 210 uJy, and 120 uJy respectively. Analysis of Astrosat data showed the CZTI detection of a long duration GRB 160703A (Swift/BAT observation:Cenko et al., GCN 19645, Swift/BAT triggered at 12:10:05 UT). The GRB occured at an angle of 134 degrees away from the CZTI pointing direction. The source was clearly detected in the 40-200 keV energy range. The light curve shows a complex structure, with a peak at UT 12:10:27.000. The peak count rate was 360.40 counts/sec above the background (four quadrants summed together), with a total of 5022.0 counts. The local mean background count rate was 352.0 counts/sec. Using cumulative rates, we measure a T90 of 45.0 secs. We carried out Giant Metrewave Radio Telescope (GMRT) observations of GRB 160703A (Cenko et al. GCN Circ. 19645) at 1460 MHz band on 2016 Aug 11.79 UT. We detect a faint source at the GRB position (Cenko et al. GCN Circ. 19645) with a flux density of 166+/-46 uJy. This is most likely the radio afterglow of GRB 160703A. Map rms is 40 uJy.